Getting a great finish on your project is the result of careful planning and preparation. Getting a great finish on your project is the result of careful planning and preparation. Consider the final use of the item and the conditions that it will be subject to. Also, consider the facilities and equipment needed as well as the level of skill required to achieve a professional looking result. Most woodworkers are not fortunate enough to have a dedicated facility for applying their finishes, which means that most finishing is done in the shop the project was built in. No matter how much to try to clean your shop, there will always be some fine dust on the lighting fixtures or other objects. This is problematic when applying a film finish as these small particles will settle on the finish as it cures leaving a rough, sandpaper like surface. This is made worse when using a compressor driven spray gun as the high pressure air from the gun will dislodge these particles. Switching to a High Volume, Low Pressure (HVLP) system to spray your finishes will raise the percentage of the coating that is actually applied to the surface while also reducing the turbulent air, which in turn will reduce the amount of dust displaced. For professional looking results that any finishing novice can achieve I recommend Milk Paint. Foolproof, easy to apply paint has been around for hundreds of years and is composed of a mixture of minerals, clay, casein (milk protein) and natural pigments. It is available as a powder and you mix it with water as needed. Once mixed, it can be stored for a day in the fridge, but it is best to mix only what you will be need at that moment. I use a small food chopper to mix the paint and with the surface thoroughly sanded, it is a simple matter of applying an even coat with a brush. When the paint is dry, usually within about 15 minutes, take some 000 steel wool and rub the entire surface to remove the rough residue. At this point, you can apply a second coat for a richer effect or leave it as is. As a finishing material, milk paint is very versatile and using some simple techniques, it is possible to create some stunning distressed finishes. Until it receives a protective top coat, milk paint will be affected by moisture. After the final coat has dried and been buffed with the steel wool I apply a coat of Watco Natural Oil. With two coats of this, the surface will be ready for daily use. A wipe on finish such as the Watco Oil is ideal for dusty shops. This oil is applied with a piece of cheesecloth and allowed to soak in. After an hour, apply a second coat, after 15 minutes wipe off the excess, and buff the surface. Watco provides more of an ‘in the wood’ finish compared to a high build polyurethane. Because this finish does not form a plastic film on the surface, it is easy to repair and renew over the life of the piece. 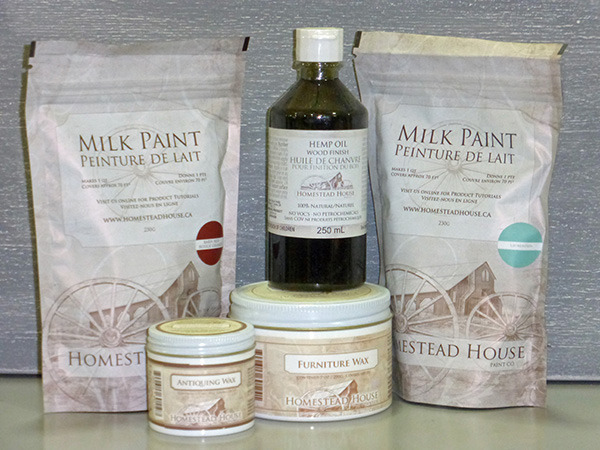 For a casual rustic finish that highlights the natural colours in wood, we use Hemp Oil. Liberally apply this natural product to the surface and allow it to soak in. As the wood takes on a dry appearance over time, simply reapply the oil to make it look like new. For cutting boards, bowls and other food safe items, mineral oil is a the best choice. It is an inexpensive, food safe finish that you can pick up at your local drug store. Michael Kampen runs the CNC shop and is the resident woodworker at Westcoast Home Hardware.